Mermaid Princess of the North Pacific Ocean, keeper of the pink pearl, and the main character of the story. Lucia goes up to land to search for a boy she saved seven years ago. She is unaware of the danger in the marine world and of her real mission until she is told of them by her "older sister," Nikora. She is characterized by her simplicity and naïveté, but with having a strong will, typical traits of shoujo manga heroines. Her idol form is Pink Pearl Voice. 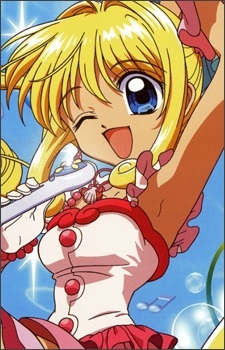 Of all the mermaids in the series, Lucia's mermaid form and human form contrast the most (Lucia has dark blonde hair and brown eyes in the surface while having lighter blonde hair and light blue eyes while at sea). Some fans in the West still spell her name as Luchia, due to a misunderstanding of the spelling systems of different languages. The Italian name Lucia follows Italian spelling rules, which say that "c" is pronounced as a post-alveolar affricate (the same sound that is written as "ch" in English) when it appears before a front vowel (in this case, "i"). That pronunciation is correctly represented in Japanese kana as るちあ. When attempting to transliterate the kana back into Latin characters, some people, unaware of the Italian spelling of the name, tried using the English "ch" to represent that consonant, resulting in the incorrect spelling "Luchia."